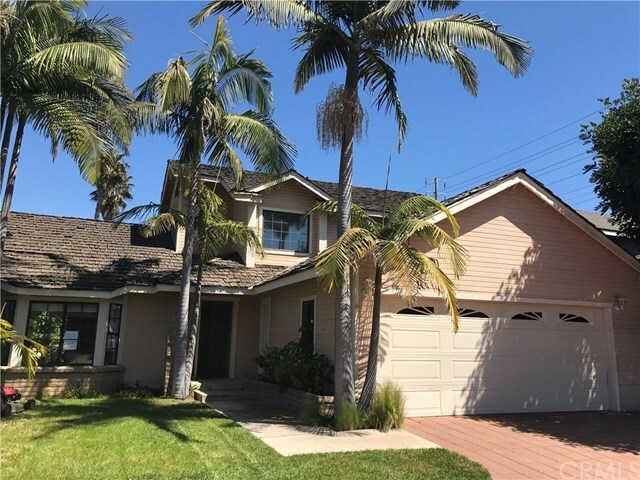 Excellent location, minutes to College Park Elementary School, Vanguard University, Newport Beach fabulous beaches, fairgrounds, South Coast Plaza and John Wayne (SNA) Airport. Don't miss this beautiful home with great curb appeal, lush tropical landscaping, swim spa and gas fire pit. This rare offering is located in a PRIVATE DEVELOPMENT on HERITAGE DRIVE with turnaround and guest parking on a cul-de-sac of only 8 homes. The home next door recently closed at $840,000 and we are $20k below. Submit an offer and remodel this home adding your special touch. SOLD "AS IS". Excellent floor plan with ground floor entry, large great room with brick fireplace and dining area open to kitchen including all appliances. The kitchen and dining area look onto the beautiful tropical backyard with a waterfall cascading into the swim spa. DUEL MASTER SUITES one downstairs with shower, 2 closets and french doors that open onto the tropical backyard with swim spa. Another downstairs guest bedroom and a full bath off of the hallway. The second floor offers a SECOND MASTER SUITE featuring a huge Spa, walk-in closet plus additional closet space all ensuite. This property has loads of storage closets and garage storage. NOTE: Property was recently a rental property, add your flooring and updates. Sold "AS IS" no warranty express or implied from Seller, broker or agent. Use your talent to make it SHINE! Owner will pay for Section 1 Termite and home warranty.